Education: B.A. M.A. MDiv. DMin. Comment to those looking at my sermons: I'm not the best priest, and I'm not the best preacher. But, I'm passionate about believing what I preach. I think the secret to preaching is believing your words. That helps me stay honest in the pulpit and not simply preach what I think the congergation​ wants to hear or what seems easy to me. I hope my sermons are faithful to the Gospels and encourage others to be a part of what Michael Curry calls, "The Jesus​ Movement." 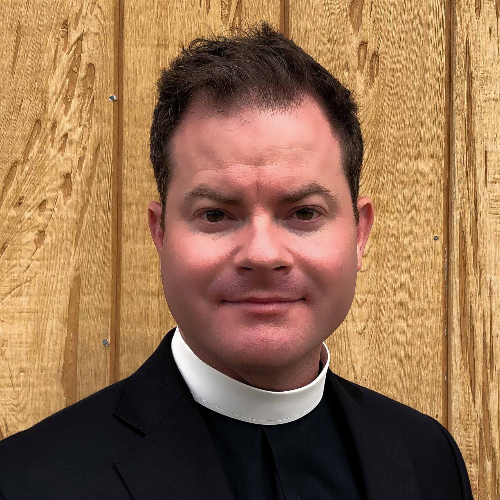 Sermon or series that made a difference: One sermon that formed me as a priest is Jonathan Landfon's sermon on the occasion of my ordination. He told me that I would suffer for the sake of the kingdom of God, but to do it anyway! One of my favorite illustrations: This is a hard one... I heard President Obama speak of the Ubunto tribe in Africa, so I decided to research them. When a person makes a mistake the entire village surrounds the person and tells them what is RIGHT with them, not what is wrong. I wonder how the church could do ministry with that mindset. Family: I'm Rian Adams and my family and friends mean everything to me! Nothing compares to the happiness we recieve​ when our children tell us they love us. My significant other is beautiful, creative, and smart. She's my best friend. What my parents think of my sermons: My mother and father are extreemly supportive of my priestly vocation! I grew up in a Pentecostal church and my parents still attend a pentecostal​ church, so there was some hesitation when I became an Episcopal Priest, but they attend services where I preach and celebrate and enjoy it. What my spouse (really) thinks of my sermons: Who knows, our true loves often miss our flaws because they love us so much. I have received positive feedback on my poetry from my significant other. Best advice given to me about preaching: I have made some mistakes. When I suffered from PTSD and untreated seizures I made a mistake and told some people on the highway I would shoot them after they threw bottles at my car and damaged it. My former bishop took me to lunch and said, "Rian, don't beat yourself up. Peter cut a man's ear off and still became the bishop of Rome. God is a God of restoration." Books that have had an impact: This is is a difficult place to begin. C.S. Lewis was instrumental to my early theological devlopmenty. I enjoy reading Richard Rhor, Thomas Moore, Carl Jung, and a host of writers. Hobbies: I'm a lover of poetry. I wrote the book Love, War, and Soul: Poems of Darkness and Light by Rian Adams. It's my journey from a combat chaplain with PTSD to recovery. I'm a amateur muscian, I enjoy writing as well. I'm an advoate for Veterans. If I could Preach one more time, I would say...: One final sermon... God loves you. No matter who you are, what color you are, what sexual orentation ​you are, God loves you! Something funny that happened while preaching: I have a tendency to leave my sermon manuscripts on the pulpitnbefore service. Once, all in good fun, one of the acolytes stole the sermon. She held it until I got in the pulpit and panicked! She gave it back but the whole church, myself included, got a fantastic laugh. Rian Adams: Sermon on the parable of the lost son, Lent 4, Year C. The sermon looks at family dysfunction. Lent 3, Year C: God's Not Mad Atcha! Rian Adams: Parable of the landowner and the fig tree. Different intrepretation​ that places us at the cent​e​r of the parable. Second Sunday in Lent. This sermon focuses ar​oun​d the idea of God as s​hiel​d but God as heavy to carry as Lent requires reflection and repentence​. A sermon on growing through temptations and not repressing them. The sermon centers around the temptation of Jesus.